The Norris Area of Yellowstone is noted for the Norris Geyser Basin, the hottest, oldest, and most dynamic of Yellowstone’s thermal areas. Few thermal features here are below the boiling point, and they are believed to have existed for over 100,000 years. The highest temperature yet recorded in any geothermal area in Yellowstone was measured at Norris: 459° F (237° C) just 1,087 feet (326 meters) below the surface! Features in the basin change daily, with frequent disturbances from seismic activity and water fluctuations. The water is highly acidic at Norris, and there are very rare acid geysers here. 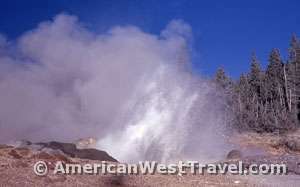 One highlight is Steamboat Geyser, the tallest geyser in the world (300 to 400 feet). There are 2 1/4 miles of boardwalk and dirt trails which access Norris Geyser Basin’s Porcelain Basin and Back Basin. One Hundred Springs Plain is an off-trail section of the basin that is very acidic, hollow, and dangerous. Travel is discouraged without the guidance of rangers. The area is connected by a short trail to the Norris Campground so you can get set up in camp and then walk over. The road from Norris to Madison generally follows the Gibbon River. Brook trout, brown trout, grayling, and rainbow trout are found in the river. The Gibbon River is fly-fishing only below Gibbon Falls, an 84 foot waterfall alongside the road. You need a Yellowstone National Park permit for fishing. See Fishing in Yellowstone (NPS) for more information. Look for the turnoff to 60 foot high Virginia Cascades just east of Norris on the road to Canyon Village. Besides the trails at Norris Geyser Basin, there are other trails ranging from one to 13 miles. A good one is the one mile round trip trail (has one steep hill) to Artist Paint Pots, just south of Norris Junction. The thermal area contains some of the most colorful hot springs, two large mud pots, and small geysers found in the area. Adjacent to this area are three other off-trail, backcountry thermal areas: Sylvan Springs, Gibbon Hill Geyser Basin, and Geyser Creek Thermal area. These areas are fragile, dangerous, and difficult to get to. Interactive Tour & Map of Norris Geyser Basin. Shows trails and all the features. Hot links to descriptions. Yellowstone Interactive Map of Norris area. Natural features in Norris area. Includes Norris Geyser Basin, and more. Things to Do in the Norris Area. Official NPS guide. The Norris Geyser Basin Museum is located 1/4 mile east of Norris Junction just off the Grand Loop Road. and is open late May to late September. Exhibits on geothermal geology, Norris Geyser Basin features, and life in thermal areas. Also, an information center and Yellowstone Association bookstore. The Museum of the National Park Ranger is located at the entrance to the Norris Campground. Other services in area: Bookstore and picnic area.